Drivers of motorhomes, caravans, trucks and buses enjoy the privilege of endless mobility and flexibility. When it comes to reversing, they are faced with all the typical risks. Whether in tight parking spaces or on difficult terrain, reversing always involves the chance of damaging one’s own vehicle or other property. With WAECO reversing video systems you will face all reversing manoeuvres far better equipped. You will get up to 80 per cent more view compared to the conventional rear and outside mirror system. 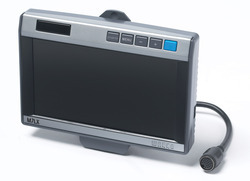 Depending on your reversing video system, the monitor delivers pictures on 5” or 7” colour LCD screens. LCD reversing video systems – space-saving versatility NEW – Completely revised, we are presenting a completely new range of reversing video systems which have been specially geared for use in recreational vehicles. The reversing video system WAECO PerfectView is equipped with the new colour camera CAM 50C. This features an especially slim design which harmonises well with modern vehicle models. Featuring easy installation thanks to plug-n-play connections and the monitor can be removed without cabling to protect them from theft.